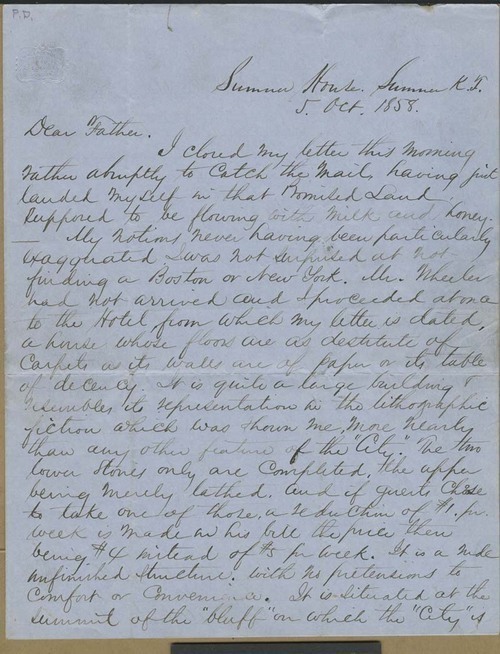 On his first full day in Sumner, Kansas Territory, Ingalls penned a second letter to his father to convey his first impressions of "that Promised Land." The reality Ingalls found and described was quite different than what was depicted in "the lithographic fiction" he had been shown back East. Other than the hotel, the "city" was composed of a "few log huts and miserable cabins . . . None of the premises are fenced," wrote Ingalls, "the whole place being open to the incursions of dogs and pigs which exist in large numbers and seem in fact to constitute the greater amount of the population." Virtually everything about the place distressed Ingalls, who was "quite unable to convey to you any definite idea of the disappointment, not unmingled with anger and mortification, with which I contemplate the State of affairs here."